On walking into the First Avenue Gallery in Sawtell last week I was reminded of those childhood summers. On either side of the exhibition space coloured planes fly up the walls leaving incandescent trails. JP Willis – has modelled the planes on McDonnell Douglas’s F15 fighter plane, the “Eagle”, precision cut shapes, two-packed smooth in bright colours. The vapour trails are coils and curls of flexible neon lighting, cleverly mounted on almost-invisible aluminium tracks that are easily fixed to a wall, with the transformer concealed in a stylish white tower blocks that works on its own as an almost sculptural piece. The contrast between beauty and deadliness has been central to Willis’s work for a decade and is clearly visible in his current exhibition. The gallery isn’t large, but it’s worth a trip for the quality of artists and the curatorial eye of the gallery directors, Jennifer England, Nicholas Kachel and Isha Black. Most of the pieces in this show are new, created at the end of a long process of experimentation with flexible neon, which is absolutely in keeping with Willis’s way of working. He becomes absorbed in the materials, learning how they work and then bending them around to his way of thinking. You can see this in his use of light. 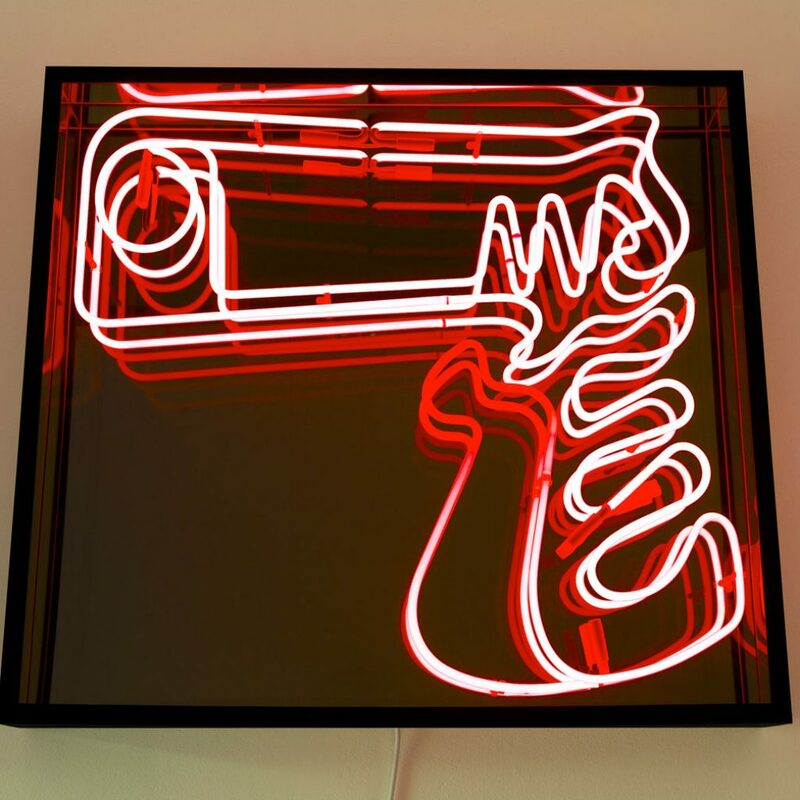 Willis uses Italian glass neon tubing to model two M1911 Colt 45s opposing each other in mirrored boxes in ‘Love Me as I Love You’. Pricing does not include shipping. Once ordered, I will send you a quote for shipping and insurance as most items need to be specially crated. Please expect at least six weeks delivery time.